Wow, M & J Bistro. Talk about a god damned restaurant nightmare. My friend Phil warned me about this place. but I laughed in the face of destiny and scheduled a happy hour. The establishment was not equipped to handle more than 12 patrons at any one time. Our happy hour was clearly overwhelming for both the bar and the kitchen. 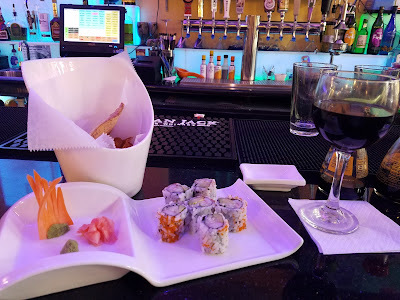 The most disappointing part of writing this review is that they seemed like really nice people that are trying to operate a decent restaurant. However, they desperately need some help. Who has ever heard of french fries in a bento box? What a great idea! The food at M & J really wasn't bad. 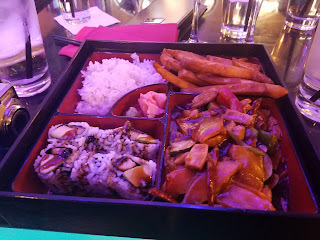 I enjoyed my bento box as well as my sushi - I would have no problem stating on the record that the food was better prepared and higher quality than the offerings at Nakama right down the street. I'm quite hopeful that Mad Noodles will also have great food. I wish the staff and owners of Mad Noodles the best of luck. However, I think it would be in their best interest to hire some type of brand and operational consultant. They are shaping up to be the next Bobby Hendrix aka Wings and Whiskey aka whatever they called it the third time before they closed. This spam doesn't even make sense.